This is for mold survivors everywhere: past, present and future. I want to tell you that there is hope because if we could survive this and end up thriving, so can you! If we had stayed in our house and not figured out what was poisoning us we would be dead now. We survived a deadly toxic mold poisoning and for that I am grateful. I am also grateful for all that we have learned in the process of finding the mold, getting out of the mold, and detoxing our bodies from the toxins. We were living in our home for 4 1/2 years before we figured out that the house itself, or the toxic mold behind the walls, was what was making us sick. We never saw it and never smelled it because it was hidden behind the walls of a fiberglass tub. Some of our symptoms were frequent colds, throwing up, stabbing pain on the right side near rib cage that was mistaken for gall bladder pain, asthma, chronic bronchitis, ovarian cysts, heart problems, sinus infections, pain, seizures, chronic fatigue, brain fog and dyslexia. For a more complete list of the signs and Symptoms of Fungal Exposure (Mycotoxicosis) visit the Mold Survivor website. My son’s room was adjacent to the bathroom with the mold and he was the sickest in the house. He went from an active, intelligent eleven year old to a sickly boy in a wheelchair who could no longer eat without getting sick, was in constant pain, was having seizures, facial tics, would fall down walking, was tired but could not sleep, couldn’t read a book or attend school. He was diagnosed with Lyme Disease and tested positive twice for Lyme. He also tested positive for Bartonella, HHV-6, Rocky Mountain Spotted Fever (RMSF), mycoplasma fermentis, Babesia, strep, ehrlicia, mercury and lead poisoning. I don’t doubt that he had all these things… but what the doctors never tested for was mold. I believe the mold held his immune system down and made him susceptible to many other infections. 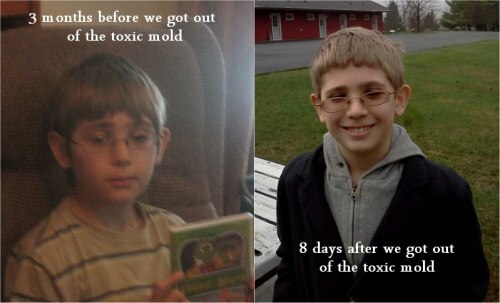 It took me 9 months after my son got very sick to find the mold. During that period of time, he had seen several doctors. I called the NYS Dept of Health three times asking if this could be environmental because even the dog was sick… they assured us that we were not in any danger from any environmental causes without ever bothering to visit our home or help us test. They brushed me off. Which is the same thing they did when I called them after we found the mold. I wanted to alert them to our experience so they could warn other families. They told me the testing I did was invalid and there was no proof that mold was ever making us sick. We tested for radon, we tested the water, we got rid of toothpastes with fluoride, used organic shampoos, conditioners, soaps, and cleaning products. We started eating totally organic, no gluten, no sugar, no dairy, no red meat, no fatty fish that might have mercury, and no meat that may have antibiotics or hormones. My son was in treatment for Lyme and his health continued to deteriorate at a rapid pace. His white blood cell count was 0.8 for 3 months in a row. Anything below 3 is dangerous. I was terrified. I kept searching. I read the book “Surviving Mold” by Dr. Ritchie Shoemaker and everything began to make sense. This book described what had been going on in my house. Right down to the spontaneous nosebleeds I had seen in both of my children. I did VCS testing on my whole family and my son and I failed the test, further confirming we were sick with mold poisoning. Remember, my son and I had been home bound, stuck in that house for 9 months. So of course, the two of us were the sickest. My husband and daughter had some symptoms… but nothing like we had. The only reason we ever went out was to go to a doctor’s appointment. I had been getting sicker and sicker myself for many months. My doctors thought it was stress because my son was so sick. I was becoming dyslexic and having trouble remembering things. Not normal forgetfulness… but things like not knowing what side of the road to drive on and not knowing right from left. I did not have a doctor who would run the tests for mold that Dr. Shoemaker recommends in his book, but my son had a pediatrician who was willing to do the testing. She ordered every test we could do in New York State. The testing not only confirmed that he was sick from mold, but that he was the worst kind of genotype, the 4-3-53. Most people get 2 genes from that test, but he only had one. That meant he had inherited the worst gene from both parents and that I had at least one 4-3-53 gene, too. I tested the house for mold using the Environmental Relative Moldiness Index that Dr. Shoemaker recommends in his book. I used the lab he suggests which is Mycometrics… I found another lab that does the same test for less money and EMSL is the lab I recommend to people. Go with Mycometrics. I have known people to do both labs and Mycometrics picks up more molds that EMSL sometimes misses. On a scale of (-10) to +20, we were a 20.3 on the ERMI scale. We had learned enough to know that if we wanted to see if mold was what was making us sick, we had to leave the house and take nothing with us. Mold gets on your stuff and if you bring your stuff with you, you bring the mold with you and you will not get well. I had an environmental company come out and do moisture testing, tape testing and air testing as well as a visual inspection. The stachybotrys found in the air on the second floor where that bathroom was was 234,000 per cubic meter. There is zero tolerance for stachybotrys because it has been linked to sudden infant death syndrome and is one of the deadliest toxic black molds out there. I don’t know how any of us were alive. Some people have success saving their clothes by washing them in 1-2 cups of ammonia and no detergent(one or more times). I had success with it on some of our clothing. We took some clothes to the laundromat, washed them and went to the Panorama Motel that wound up being our home for the next 10 1/2 months. We showered in one room, changed into our clean clothes and slept in another room. Four days later my son was visibly better. He was walking around, slowly at first and playing for short bursts of time. It took him 4 1/2 months to fully recover. He is still doing well, today. We remediated our home. Many said it could not be done, but through a lot of hard labor, a lot of research and experimentation, we got the mold out and replaced moldy building materials with safer materials. We threw out most of our possessions, what we didn’t toss we put in storage and I can’t go near it. It’s like kryptonite to me. My husband did most of the work himself and it took many months and over $35,000 later, we had a home I was no longer reacting to. We moved back into our home in February of 2012. I worked hard on getting to my health back. I feel good most of the time, now. And I am getting better every day. It is a blessing to be aware of the toxins in this world. I feel bad for all the people who have blinders on and don’t know why they are sick. But it took a long time, a strong focus on health, faith, a positive attitude and all the things I learned researching online and from networking with other people who have gone through this kind of upheaval. In August of 2012, 18 months after getting out of the moldy house, I still had chronic fatigue, severe brain fog and dyslexia, digestive problems and pain, and hypersensitivity to mold and chemicals. I was a prisoner in my own home-going out was always a risk because 70-80% of the buildings and people were making me sick. My recovery didn’t happen overnight because I didn’t get sick overnight. I lived in that home for over four years… and many moldy houses before that. This site is for sharing things that helped me get well. This is so wonderful, Heather. I’m thrilled to see someone recover, stay in their home and go on to help others. Thanks Amy! I can’t tell you how good it feels to help others get through this. I believe everything that happened to us happened for a reason and that we were meant to help people with our experience. This is wonderful… Good for you. I have been working on a chapter, in my book, on toxins. It was nice to read this. Hi…we recently left our house and it’s belongings behind after 17 years! I finally had put two and two together after 2 out of my 3 kids became very ill. I had put so much of my time into my sick kids and cat to realize we were all sick. Hopefully as painful and stressful as it is we will all feel better soon. My 11 year old has a lot of the same symptoms your son had. My 16 year old suffered neurologically. It’s been tough. Thanks for the article. I wanted to tell you that I truly understand… and will be here to answer questions if you have any. I am so sorry you are going through this… and glad that you figured out what it is before it was too late. Much love and strength going out to you and your family! Wow, thank you for putting your story out for others to read and learn from. So glad you had success with the all the hard work – that is quite an achievement. I’m so thankful to read a success story because they seem hard to find. My husband and I are in the middle of trying to remediate and have become unsure of what to do, and in what order to proceed. In particular I’d be interested to know if you had to address contamination of ducted heating and cooling system as a result of it pulling in released spores & microparticles from other areas of the house/basement. We are also wondering about the best method and/or product for coating concrete block once it has been cleaned. I’m chemically sensitive and all the products used by professionals have pesticides and odors. Nancy – yes we had our metal duct work cleaned twice. Definitely have to clean ducts if metal and replace if they are the accordion type. I don’t think coating concrete block is always a good idea. Depends on the situation. Mold can grow behind paints and sealers and those sealers can act as mold food. We opted against painting the interior of the concrete basement and only painted the outside. Thank you for commenting. Connect with me on facebook if we haven’t already… and keep asking questions!! Heather, thanks so much for the quick reply! I am following you on FB now. I’ve re read your history a few times and your family is amazing. I am just so very sorry for what you’ve been through but so very encouraged by the outcome. My husband and I are so happy to get feedback directly from someone who has been through this and is so willing to share. How was it determined that your ducts were contaminated, and then after cleaning, how was it determined that they were no longer problematic? Why did you have your ducts cleaned twice? I can think of a few reasons, but am very interested to hear yours. And how were they cleaned – via professional vacuuming, or did they require more? 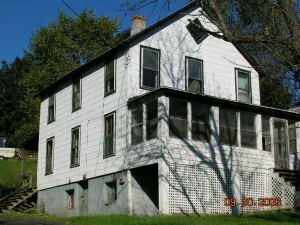 At what step during the house remediation process did you have it done? We have the metal ductwork so we will pursue cleaning thru looking up service providers at http://nadca.com/en , which has been recommended to us, but am interested in the path that worked for you. I have had the same thoughts about concrete block coating as you. I’ve read a lot and putting it all together made me very unsure about going through with that process for the reasons you note. We have performed some remediation already to immediately address the water intrusion and resulting mold in our unfinished basement, and are in the process of continuing in an effort to lower the currently unacceptable ERMI scores in both the first floor and basement of our rancher. I believe the basement mold came upstairs through HVAC, and our activities of tracking it up. It’s possible that I brought it in from my workplace too. The basement block walls have been HEPA vacuumed several times, but never wet-scrubbed because we didn’t want to introduce that kind of humidity to the rest of the basement’s wood material. More cleaning remains to be done and the most difficult thing to address for us is the concrete block, since it is not amenable to typical damp wiping with borax like all the other smoother surfaces. You noted your starting ERMI score – to what lower value have you been able to reach with all your hard work, and that is low enough that you all no longer react? Did you use the ERMI test several times during remediation to help guide your efforts or did you stick with your environmental company? I would like to ask more later, but please let me know your preferred place (blog, FB, personal email) to hold the conversation. We lived in a house which had 234,000 spores of stachy in an air test. The ducts were contaminated because the heat had been on with that kind of mold in the air. Everything in the house was sniff tested by me. The house was empty and I would come in and say whether anything was bothering me. I was super reactive. I would vomit, my tongue would swell, face burning… so I was the tester. Not the best way to test things because of Shoemaker’s “sicker quicker” theory… but it was all we had. Most tests are not sensitive enough to help an extreme reactor. Why did you have your ducts cleaned twice? Another good question. We did it once, in the beginning of the remediation and then toward the end we felt there had been enough dust flying during the remediation to need them cleaned again when we moved back in. They were cleaned with vacuums and brushes that go through the ducts. the brushes knock the dust off and the vacuums pick up the dust. It’s one of the few things we did not do ourselves. I have read that 50% of indoor air in a home comes from the basement or crawlspace. So if it’s in your basement, it’s in your ducts, it’s in your house. Sorry you are going through this. If you are sick, don’t overlook that all porous surfaces should be suspect of cross contamination until you are not sick. I don’t use the ERMI anymore. I use the HERTSMI-2. It’s still a dust test but it only measures 5 of the most toxic molds instead of 36 molds. It is a better measure of why people are sick. You can read an ERMI using the HERTSMI scale. I’ll get in touch by email too… good luck with everything! Kellie – I am going to send you a note to see how you are doing… and what I can do to help. Know that anyone can get well. Thanks for reaching out! We recently discovered asp/pen and stachy in my daghters’ bedrooms. One daughter has been ill on and off for the past few years. Mainly fatigue and malaise with an occasional blotchy red skin rash she would get on her chest. Derm told us it was just a sensitivity. More recently it became vomiting, headaches, fatigue, vertigo, ear pain. Just recently, upon the recommendation of a contractor who is a casual friend, did I have their rooms tested. Prior to this, I had two home inspectors at my house who said they saw nor smelled anything so I would be wastingmy money on the testing . Thankfully, I didn’t listen. I almost cancelled the test. We are now waiting for our second appt wherein we will receive the results of her tests. My question to you is…how did you go about detoxifying? Also, I am now so paranoid and find myself scouring the house with a flashlight looking for any signs of mold. I am wondering if anyone has experienced this kind of paranoia and wether or not it ever really goes away…? And the guilt I am feeling that I didn’t protect them? I wish I had connected the dots sooner. We went all natural for detoxing the kids… but first thing is to get out of the exposure. Stachy is the most deadly of all molds. I would get out of the house and take nothing with you until you can fix it. It used to be, I would tell people to get out, throw out everything you own and go live in a tent. We spent over $40K remediating and my husband did all the work. Hiring someone else can be much more money and the success rate of remediation is very low. Luckily, some people have found a better way. Everyone is different in what works for them in detoxing… how old are your children? What are their symptoms? Where are you located so I can try to find you a doctor who can help? There are natural antifungals, binders, even tests you can do without a doctor… so you don’t necessarily need a doctor if we can’t find you one, I can plug you into a support group where you can hear what is working for others and make qualified decisions. Most doctors and even health departments are unfamiliar with mold poisoning. They will even tell you that it is not possible to get the symptoms you are describing. Don’t let them talk you back into the house without getting rid of the mold. I have watched that happen to many children… and it is heartbreaking. Stachybotrys produces Tricothecene Mycotoxins and those are used in bio-warfare to KILL people. They are deadly. This is not a mold allergy, it is a poisoning. If you need anything, just ask. And know that you can and will get better. Most children bounce back quickly. Thank you for your information! We have had tests done and have elevated spores of the aspergillus. We have a contractor friend who will remediate for us, using all the precautions, etc. Can you explain a little about how your husband went about his process? Also, the Clean Air Fix link isn’t working above…can you tell me what that is that you were referencing? Hi there. I am hoping that someone will get this message as my 70 year old mother is in desperate need of help. She fears that her 1 bed room home is infested with Mold and she lives there with her 29 year old Paranoid schizophrenic son. My family and I are not in a position that we can help her financially to get the test done or help her fix up her place. My 80 year old father whom had an apartment which she was able to stay there was recently given noticed that he also has to move out in less than 30 days and now they all have no where to go. We are in need of help to get them a home or they will be forced to stay at a shelter. I wished that there was a way that I could help them but I am down to a bare minimum and live far away from them. Sending you an email — not sure what we can do to help. Praying for your parents. I am recently suffering from a mold illness, mine entered one evening through my pulmonary system & I’ve been sick & getting sicker ever since. I’ve had to leave my home & family as my husband sells the house and we start the arduous process of where do we go? I’m at my moms 3000 miles away and still having symptoms, not as severe but still not sleeping well if at all, knees and joints hurt, brain hurts, jaw hurts, rashes on my neck. Initially I was a lot better but the small amount of items I brought with me I think have cross contaminated & increasing my symptoms after 2 weeks here. I’m trying to treat but feel like I can’t escape the micotoxins (I believe aflatoxins from aspergillus in our home, I suffered at work too but not sure what mold was there with no test). I’m researching everything I can but feel lost on recovering and getting back to my family. Cross contamination is a real issue but just so you know – many buildings have mold so it may have been there before you brought your stuff. The only thing I have found that gets rid of mold and mycotoxins is Hi Tech Air Solutions air reactors. Please do a search on this blog about the tests and testimonies of people using Hi Tech and consider one or more for yourself. Mold avoidance is necessary and it is so much easier with Hi Tech. I was able to save books, artwork, pictures and more once I starting using Hi Tech. Thank you for sharing your mold survival experience. We found ASP/PEN group mold behind the shower room wall which I think it was due to leakage. Is ASP/PEN the same type of mold which caused your sickness? If not, which toxin mold did you find in your house causing the issue? We had asp/pen but we also had stachybotrys – either of these and a few more create mycotoxins that can make people sick. Mold of any kind is something to get rid of – but if it’s toxic mold I would be more concerned.